We just noticed a popup on the chat side-bar inside Facebook, whilst using a Windows computer to test our Copy & Paste Memes for Facebook Chat application before releasing the first full version. It appears that Facebook have just released their standalone messenger app for Facebookers using a Windows operating system. The application allows users to chat with their Facebook friends in a simple tabbed interface, to check their news feed and delivers notifications directly to the desktop. 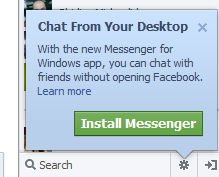 To get the application today simple head to the Messenger for Windows landing page. Prev:Majority of Draw Something fb fans are NOT happy with Zynga buyout. Next:Pillow Fighting in Trafalgar Square London? Yes!